One octave has 12 sounds and 21 letter symbols: 7 natural, 7 flat (b) and 7 sharp (#). And with these 21 letter symbols we can spell 15 major scales in 15 major keys. Now, here’s a simple question: aren’t there really 21 major scales? The answer is yes, but to spell them we need 14 more letter symbols: 7 double flat and 7 double sharp. For example, to spell the Fb major scale, we need B double flat (Bbb): Fb Gb Ab Bbb Cb Db Eb, and to spell the G# major scale, we need F double sharp (F##): G# A# B# C# D# E# F##. Remember, the reason why there are only 15 traditional major scales is because only 15 major scales can be spelled with 21 letter symbols. To spell any other major scale not shown above we would need to use double flat or double sharp letter symbols. Here is something important. Even though each major scale has a different letter spelling, they all have the same tone number (scale degree) spelling: 1 2 3 4 5 6 7! The different letter spellings are the result of applying the major scale interval pattern (whole step, whole step, half step, whole step, whole step, whole step, half step,), to each of the 15 major scale key letters. On the guitar and bass fretboard, a half step is one fret and a whole step is two frets. ’til next time, have some fun playing 15 major scales with 12 sounds, and spelling 15 major key signatures with 21 symbols… I’ll be listening! In 1722, Jean-Philippe Rameau defined harmony as “…the gathering together of several sounds which are agreeable to the ear.” This traditional definition of harmony is still true today – but needs a little modern updating. Let us begin by stating that harmony begins with one sound, and this first sound of harmony is symbolized by a letter and a number. 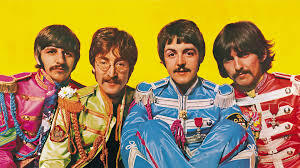 The harmony letter may be one of 21 letters, <https://12tonemusic.wordpress.com/2014/04/10/learn-guitar-in-a-flash> but, the harmony number can be only one number, tone 1. 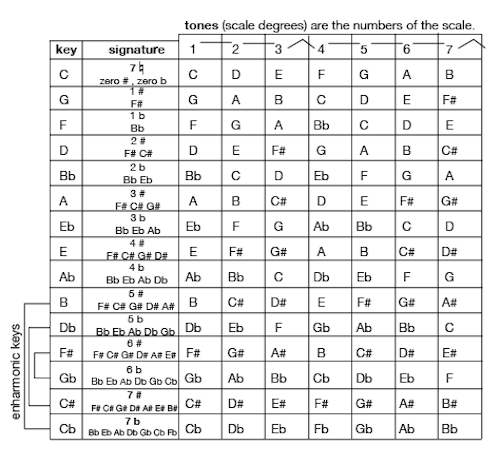 Tone 1 is also known as the root, tonic or scale degree 1. Harmony then proceeds to gather more sounds by adding letters and tone numbers in a numerical order. The progressive harmonies that result are then given harmony names. For example, two sounds with the same letter name, or with two different letter names is called an interval. Three sounds with three different letter names is a triad. And four sounds with four different letter names is known as a tetrad. Theoretically, harmony continues extending until it includes all 12 sounds with 21 different letter names. Thank goodness dodecaphonic harmony can’t be played on a six string guitar! However, harmony can be played on the guitar in two different ways: melodic and harmonic. Simply stated, melodic is defined as one at a time and harmonic is at the same time. When harmony of three or more different letters and tone numbers are played melodically, one at a time, it is called an arpeggio. And when harmony of three or more different letters and tone numbers are played harmonically, at the same time, it a known as a chord. Intervals of two sounds may be played both melodically and harmonically, but, are not considered or called arpeggios or chords.A traditional harmony symbol, such as Cm (C minor) is almost always referred to as a chord symbol. However, this would not be true if the Cm harmony was played as an arpeggio. In that case, the Cm harmony symbol would have to be called an arpeggio symbol, and that sounds weird. So, to avoid naming harmony by the way it is played, simply use the term harmony symbol. That way, you are free to play the harmony however you wish, either as an arpeggio or as a chord.Harmony is grouped into types based upon the 3rd and 5th intervals. The 3rds intervals are: natural three major (3), flat three minor (b3), and sharp three suspended (#3). In traditional harmony, #3 is called 4 but as we will see in later lessons, this creates a lot of unnecessary confusion: think dominant 11. The 5ths intervals are: natural five perfect (5), flat five diminished (b5), and sharp five augmented (#5).By combining the above six interval types, nine triads result: major 1 3 5, major flat five 1 3 b5, major sharp five 1 3 #5, minor 1 b3 5, minor flat five 1 b3 b5, minor sharp five 1 b3 #5, and suspended 1 #3 5, suspended flat five 1 #3 b5, and suspended sharp five 1 #3 b5.By adding the remaining major scale tones: 6 7 9 11 and 13 (plus their chromatic flats and sharps) to these nine triads, a virtually infinite number of harmonies is created. A harmony progression is when an arpeggio or chord harmony moves forward to another harmony of any type. The definition of progress is to move forward. Therefore, by combining these virtually infinite number of harmonies with an equally virtually infinite number of harmony orders, the result is more harmony progressions than anyone on Earth has time to play! ’til next time, have some Zero Inversion harmony fun and don’t forget to progress! P.S. If you liked this lesson, or even if you didn’t, please leave a comment and tell me so. Here is an impromptu video interview I did last week with www.findaguitarteacher.com ~ please check it out and let me know what you think. And when you have a moment, watch more of my instructional videos on the 12tonemusic.com YouTube channel www.youtube.com/user/12tonemusic. Thank You. Wouldn’t you like to be let in on something that other guitar players don’t know? Imagine what you would be able to do with this hidden information. Well, here are three little known, and rarely understood, secret fretboard angles that will change the way you view your guitar fretboard. Does the following look familiar to you? It should, it’s your fretboard! ’til next time, have some fun connecting the diagonal octaves of all 7 letters because it’s a secret no more . . . I’ll be listening! You are currently browsing the 12tonemusic blog archives for August, 2014.